Searching for comfortable and affordable holiday apartments Burleigh close to the beach? Look no further than Horizon Holiday Apartments in Burleigh Heads. Situated only 50 metres from the sweeping white sands of the fully patrolled and award winning Burleigh Heads Beach, Horizon Holiday Apartments is the ideal base for a seaside break to remember with the family. 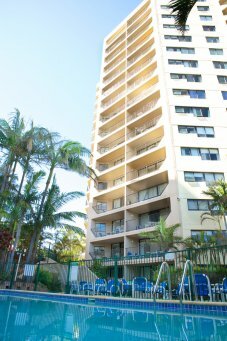 The 15 storey resort offers a selection of one and two bedroom holiday apartments Burleigh Heads, each of which are completely self contained and feature fully equipped modern kitchens, laundry facilities and private balconies for making the most of the glorious Queensland sunshine. During your break you can take full advantage of our superb range of guest facilities which include a heated swimming pool, spa, sauna room, children’s playground, games room and a mini golf course. One of our most popular facilities is our private walk way to the beach – just a short stroll will take you straight to the sun soaked sands of Burleigh Heads Beach! Located just a stone’s throw from our holiday apartments Burleigh, the beautiful beach was ranked in the top ten best beaches in Australia by TripAdvisor users and it’s easy to see why. With perfect surfing, body boarding and swimming conditions, pristine white sand and a lush parkland backdrop, the north-facing beach is sure to become the focal point of your holiday at our Burleigh Beach accommodation. Back at the resort after a busy day on the beach with the family, you can enjoy a laid back barbecue lunch in the tranquil setting of our lush landscaped gardens, or sink into the spa for a long, relaxing soak. Discover all the beauty and excitement of the Gold Coast for yourself – book your stay at Horizon Holiday Apartments Burleigh today!